4 Beds 2 / 1 Baths 1 Partial Bath 2,702 Sq. ft.
District DUBLIN CSD 2513 FRA CO. Description: Open sunday, july 1 from 1-3! 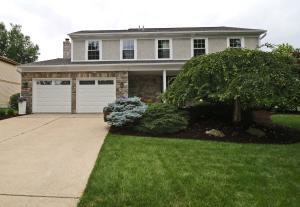 Stunning 2 story on cul-de-sac in indian run meadows with extensive interior & exterior updates by dave fox remodeling. New carpet & paint inside and out. Kitchen features granite counters, ss appliances and ceramic tile floor. Family room with wood-burning fireplace opens to kitchen. Custom lighting throughout first floor. Exterior completely redone with stone and stucco. Trex deck with pergola, and paver patio are perfect for entertaining. 4th bedroom currently a sitting room with opening to master that can be dry-walled in if desired. First floor laundry includes lg washer/dryer. Finished basement with nature stone floor and capped crawl space. Updates:roof 2014, windows 2004, garage door 2012, stone chimney 2007, hvac & humidifier 2010. Move in ready!